A major challenge to the oral formulation of peptides and proteins into efficacious dosage forms is to ensure the stability over their shelf life, which ideally is at least 2 years at room temperature. Moreover,most injectable proteins are marketed as lyophilized products, and these need refrigerated storage. The BioLingus technology was developed initially to improve the stability of cytokines. This resulted in what is called the "Cytokine Stabilization and Slow Release" technology, abbreviated as CSSR. Over time, multiple "generations" of the technology have been developed, and the latest is called "CSSR-6" – being the 6th generation. The technology behind the formulation stability is inspired by nature. Although it is generally accepted in science that "proteins are not very stable", mother nature has developed a successful way to stabilize proteins over a very long time. Figure : Nelumba nucifera (Indian Lotus) : in the seeds of the Indian lotus plant, proteins are stabilized and can preserve their functionality up to 1000 years. The scientific mechanism that enables plant seeds to preserve the functionality of proteins over such a long time - often in extreme conditions of temperature and moisture - has been studied over decades by plant biologists. Through advanced bio-engineering, the BioLingus SEED Technology mimics what is happening naturally in the plant seeds and allows us to stabilize biological molecules for long periods of time, as can be seen in the graph below. 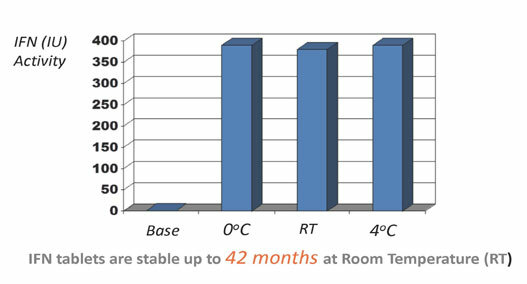 This demonstrates that the CSSR-formulation of interferon-alfa is stable at 42 months at room temperature. In summary, the SEED technology is our specialized formulation to stabilize biological molecules. Most injectable proteins are marketed as lyophilized products, and most of these need refrigerated storage.